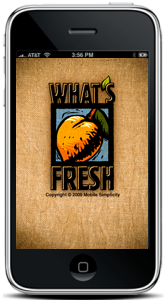 What’s Fresh will help you to eat the freshest foods by allowing you to know anytime, anywhere what fruits and vegetables are currently in season in your area. This knowledge is valuable to make selections that are beneficial for both your health and for the environment, whether you are at home or at the market. The transport of fruits and vegetables not only diminishes the taste and the nutritiousness of food, but the fuel used to transport food causes harm to the environment through the destruction of natural resources as well as through emissions. What’s Fresh assists you in making more sound shopping decisions by logically displaying fresh foods in your area. For seasons when little is fresh in your area, What’s Fresh allows you to determine where in the country your desired item is in season so that you can be more certain that the produce you buy is fresh and delicious. Finally, What’s Fresh helps you plan your eating in advance by providing a Freshness Calendar displaying what items are in season throughout the course of the year in your area. All this is accomplished in a beautifully designed app that is intuitive and pleasurable to use – an app that you’ll want to share with others. ∙ Lists in season fruits and vegetables within a user-defined region and displays them in a simple and intuitive dashboard. ∙ Provides a calendar to show what products are in season throughout the course of the year in your area, and if they are produced fresh or in a greenhouse.